When putting together the design for this project, we took a page right out of the old form meets function text book. The result is an extremely practical space that looks great from any angle! Starting on the upper level, we built the deck flush with the house floor this creates an easy flow in & out without worry of missing a step. Once outside, you’ll find yourself protected from the elements by a stunning A Frame porch – with its white soffit ceiling, defining stone columns & overall clean line design. Step down to the patio & you’ll find a simple space with its focus on cooking. 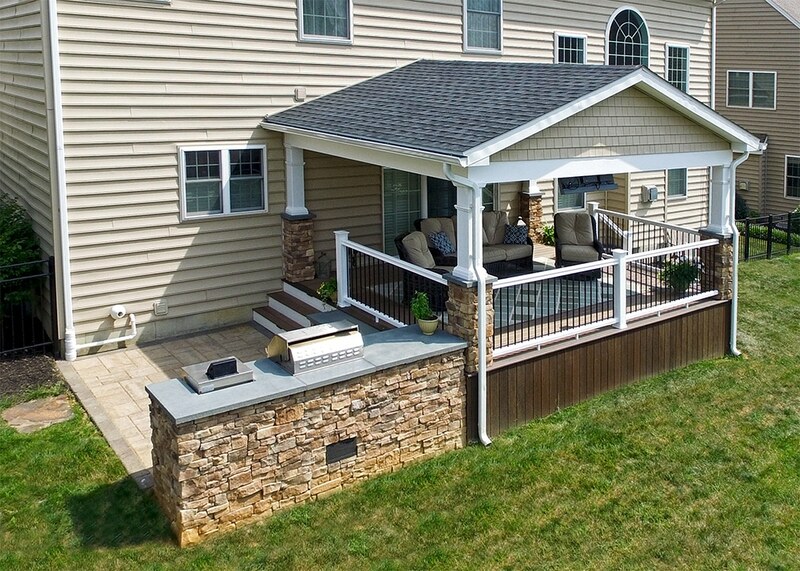 All around, the project features low maintenance products from manufactures like, Timbertech, Techo-Bloc & Stonecraft. All of which guarantee this project is here to last.